The Bethel Mennonite congregation was formally organized on 12 December 1947 with 26 members. The church was formerly owned by the United Church of Canada. The first pastor was Newton Gingrich, who was ordained 19 June 1949. The first deacon, Henry F. Martin, was ordained 5 September 1948. The first building was occupied in 1948. Reuben Dettweiler was the founding bishop of the congregation. The congregation originated through outreach of the Elmira and Floradale Mennonite churches. Gospel Herald (6 January 1948): 12; (20 April 1948): 379. Mennonite Reporter (29 May 1989): 12. Church records at Mennonite Archives of Ontario include unpublished 2 page history; "Mennonites buy Pilkington United Church," (undated newspaper article) MAO; Mennonites in Canada collection "MC(1830-Moorefield)." Weber, Linda. "A Brief History of Bethel, Berea, Moorefield, Glen Allan, and Listowel," Research paper, CGC, 1971, 37 pp. Dettweiler, Reuben and Marlene Epp. "Bethel Mennonite Church (Elora, Ontario, Canada)." Global Anabaptist Mennonite Encyclopedia Online. January 1989. Web. 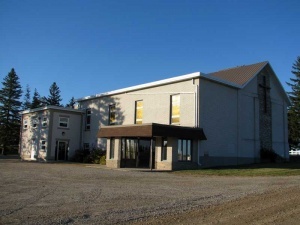 25 Apr 2019. http://gameo.org/index.php?title=Bethel_Mennonite_Church_(Elora,_Ontario,_Canada)&oldid=146919. Dettweiler, Reuben and Marlene Epp. (January 1989). Bethel Mennonite Church (Elora, Ontario, Canada). Global Anabaptist Mennonite Encyclopedia Online. Retrieved 25 April 2019, from http://gameo.org/index.php?title=Bethel_Mennonite_Church_(Elora,_Ontario,_Canada)&oldid=146919. Adapted by permission of Herald Press, Harrisonburg, Virginia, from Mennonite Encyclopedia, Vol. 1, p. 311. All rights reserved.